The Federal Point Historic Preservation Society held its monthly meeting on Monday, July 16, 7:30 pm at the Federal Point History Center, 1121-A North Lake Park Blvd., adjacent to Carolina Beach Town Hall. Joining us was Kevin P. Duffus an award-winning filmmaker, researcher, author, and investigative journalist of historical events. He has published three books and produced four documentary films on various maritime historic topics, including shipwrecks, lighthouses, and the devastating German U-boat attacks off our coast in 1942. 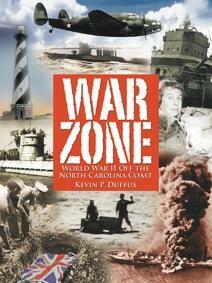 He spoke about his new book, War Zone: WWII off the Coast of North Carolina. War Zone is a gripping panorama of the shameful betrayal of merchant sailors, of young Coast Guard recruits watching helplessly as sailors plunged into pools of burning oil, and of the baby born in a lifeboat. Learn about the intrepid men and women who defended America in little boats and in small planes; the truth behind the famous phrase “Sighted sub, sank same”; and the children who spied on German spies. Discover the real story behind the legends of secret agents, midget-submarine landings, a busload of naked Nazi U-boat POWs at New Bern, and the shelling of a chemical plant on Kure Beach. Follow the accounts of three climactic engagements between U.S. forces and German U-boats off the North Carolina coast with the Battle of the Atlantic hanging in the balance. This program was made possible by a grant from the North Carolina Humanities Council, a state-wide nonprofit and affiliate of the National Endowment of the Humanities. We had a record 73 people in attendance at our July Meeting where author Kevin P. Duffus presented an amazingly well researched history of the U-Boat activity off the coast of North Carolina in the early days WWII. This program was made possible by a grant from the North Carolina Humanities Council, a state-wide nonprofit and affiliate of the National Endowment of the Humanities and the audience was at least two thirds visitors from the community. Kevin also signed his books and we have copies of War Zone and his earlier book The Last Days Of Blackbeard The Pirate for sale in the gift shop if you didn’t get one that evening.